Score and Parts. Composed by David Schiff. LKM Music. Classical. 92 pages. Lauren Keiser Music Publishing #X652708. Published by Lauren Keiser Music Publishing (HL.102760). 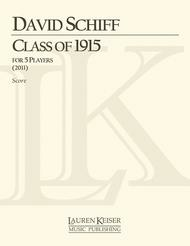 “Class of 1915” was written in celebration of the dual centenaries of Reed College and Arnold Schoenberg's celebrated work, “Pierrot Lunaire.” Though the work shares the same instrumentation, which has become popular among new music ensembles, Schiff's work is a celebration of popular song and dance styles from the mid-1910's arranged in a suite that makes an ideal curtain-raiser for “Pierrot” concerts.